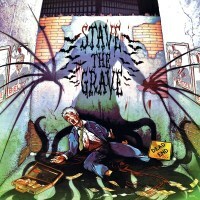 Dead End from Stave the Grave is a fast-paced, rocking 4 track compilation, that comes loud and proud. With elements of rockabilly, metal and even a hint of progressive rock in there; the band throws punchy, rhythmic tracks that’s enough to get your gears going. For fans of horror rock and that 70s rock sound, Stave the Grave is definitely one band to watch out for. Made up of Alessandro Melle on drums, Diego de Benetti on guitar and vocals as well as Luca Rista on bass and backing vocals; this hard rock trio has been making waves in their local rock scene since 2006. Their latest release Dead End features four energetic and pulsating rock tracks that’s sure to make you do more than just tap your feet. Even though there are rockabilly elements, there are also instances where the band sounds like they’ve taken one or two lessons from the Slayer handbook. Cuts like Stupid Illusion, notably its intro, showcases this distinct guitar work influence; building a straight up, in your face sound that makes you stand up and take notice.